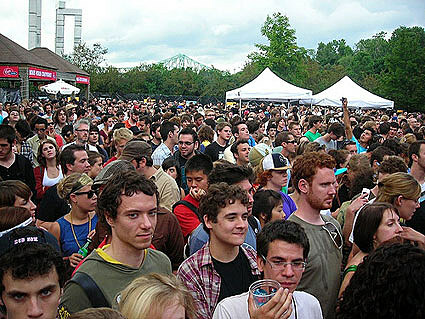 It is an open secret that the Osheaga festival is on shaky ground. It is rumored that the festival lost money the last two years. This year was make or break. When I spoke with somebody connected with the festival, he commented that they really only need one big day to turn it around and come back next year. With a combination of big names (Jack Johnson, Broken Social Scene, The Weakerthans) and a string of artists with a rep for killer live performances (MGMT, The Go! 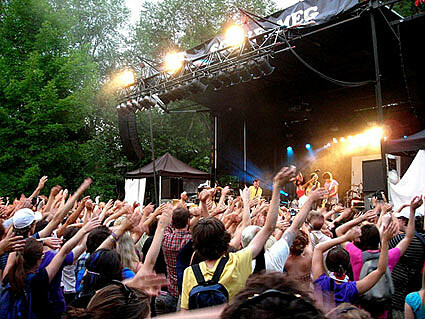 Team, Gogol Bordello), Osheaga organizers seemingly set Day 2 (Monday August 4) as that day…. 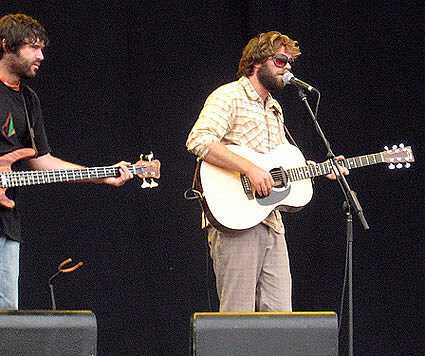 I started my day with the wistful folk of Neil Halstead (who I later interviewed). I’ve always wanted to see Mojave 3, but this is a more than acceptable consolation. His voice is as smooth and relaxed live as it is on record. It was a very lax performance and served as a good opener for a full day of music. Next up was Rogue Wave. Their mid-tempo sway served as a nice counterpart to Halstead’s mellow movements. After their set, Matt Costa took the stage and played his bouncy folk-pop for the increasing audience. 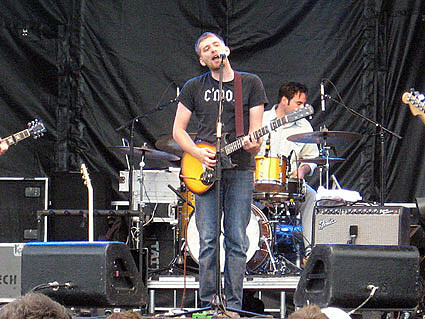 The 1-2-3 of their appearances worked off of each other very well so it wasn’t all that surprising when I discovered that they are all on Brushfire Records, the label owned by headliner Jack Johnson whow was the headliner of the day. The turnout for day two was noticeably larger then at the same time yesterday. I guess my initial hesitation over booking a festival on a Monday was way off. 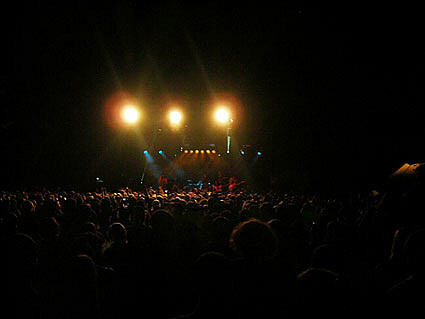 The larger attendance is put more in focus when I hopped on over to The Kills and saw it was standing room only. The Kills don’t really do it for me, but I can say that their performance sounded very much like their records and was very well received by the audience. Next I went to check out The Weakerthans and they got a great reaction. They have a cult following in the States, but up here are bigger and the crowd and reception to their set reflected that. The Black Keys followed. Man, were they loud. Auerbach and Carney work so seamlessly together that they achieve this simultaneous synergy of being very loose and professional at the same time. They certainly had control over the stage and the setting, but watching the duo play so close together on the massive stage made me crave to seem them in a small bar. But by the crowd and reaction they received, that time has passed. After a prolonged delay (technical problems, it appeared), the packed crowd for MGMT was getting antsy. To compound matters, it became evident the Brooklyn duo was placed on the smaller M.E.G stage and the turnout overflowed.. When they were able to perform, they received the loudest cheers and applause I heard all festival save for when Iggy played the night before. Went to the main stage to check out Gogol Bordello. I don’t know if it was just being tired from the constant music over the previous three days, their inability to transfer their well received club shows to a larger platform, or both, but they didn’t do anything for me at all. Exhausted, I crashed on the hill for an hour, paying no attention to the end of Gogol’s set or the next act Duffy for that matter, so I can’t comment on it. Because of the snafu before MGMT’s set, I was able to catch most of Rock Plaza Central‘s set, which was great because the big decision of the day was having to choose between seeing them and The Go! Team. RPC are one of those great unheralded bands going today and their set demonstrated why that is a shame. It was intense and impassioned and one of the highlights for me of the festival. Walked over to the other stage and saw The Go! Team perform the other great highlight for me on Day 2. Their reputation as a live act preceded them, so the anticipation was pretty high but they pretty much nailed it. As the sun was setting, Broken Social Scene took to the main stage and performed a potpourri of songs from the scattered albums and side projects, including The Apostle of Hustle, Kevin Drew, and Brendan Canning‘s new record. They have been known to play three hour sets, but the mechanics of the festival forced them to stick to those songs that everybody knows and loves, like “KC Accidental” and “Stars and Stripes.”. Surprise guest Amy Millan (Stars) showed up and performed “Anthems for a Seventeen Year Old Girl,” as well. Another great, dependable set from a great, dependable band. At this point I was exhausted, and though I wanted to see Chromeo, I didn’t want to wait an hour to hear them so I decided to call it a night. A very good day of music and the very large turnout would (hopefully) suggest that there will be another Osheaga this time next year. If you haven’t already, check out my Day One recap too.